Fiberglass catch basins are available with a variety of frames and grates. Channel collars are available to connect all depths of either FG100 or FG200 on any side of the catch basin. Pipe adapters are available to allow inlet/outlet pipes at any position on the catch basin. To attach collars or pipe adapters, first cut hole to required size then secure part to the outer wall of the catch basin using appropriate sealant. 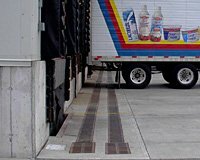 Grates - a choice of galvanized or stainless steel bar or slotted ductile iron grates, locked in place with 2 bolts. Trash bucket (F660 / F880) - plastic trash bucket designed to collect debris that has collected in the trench and washed into the catch basin. Frame - coated black, galvanized or stainless steel frame attached to catch basin body with snap-fit studs. Catch basin body(F660 / F880) - fiberglass body in choice of two sizes. Channel collar (FG100 / FG200) - adapter to enable smooth transition of any depth FG100 or FG200 channel on any side. Can be cut to correct height. Call 800-277-5015 to place your order for Fiberglass Catch Basins!